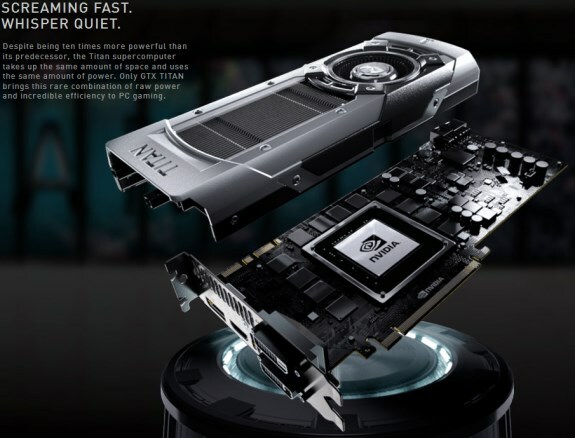 NVIDIA officially shows off the GeForce GTX Titan, its new GK110-based graphics card for consumers. The card features 7.1 billion transistors, 2688 CUDA cores, a 384-bit memory bus, 288GB/s memory bandwidth and up to 4.5 teraflops single-precision and 1.3 teraflops double-precision computing power. The GTX Titan has a high-end design similar to the GTX 690, with an enclosure made from cast aluminium and a liquid magnesium alloy. Cooling is provided by a vapor chambor with an extended aluminium fin stack and a lateral blower fan. The GeForce GTX Titan is clocked at 837MHz, with a 876 Boost clock and 6GB GDDR5 memory clocked at 6008MHz. The card has a 250W TDP, it uses a 6-pin + 8-pin power connector and has 2x DL-DVI, HDMI and DisplayPort 1.2 outputs. One of the new features of Titan is GPU Boost 2.0, an improvement of the GPU core clock boosting technology that's based on temperature rather than power draw alone. On top of that, GPU Boost 2.0 also lets overclockers go beyond the recommended voltage specifications. The launch price of the GeForce GTX Titan is $999 with availability slated for early next week. At present, there are no benchmark results available, the reviews are still under NDA until February 21st.